Well, with the Hitachi deal in mind the recent comments and reports are scary. That the President Zuma stands and asks for pledges because that is good for business, that sounds like “buy-a-politician-program”. That is something that isn’t democratic or has the values that the ANC supposed to stand for. If looking at history and Mbeki with the famous arms-deals was bad enough. This will open the floodgates for more. Just read the comments for his speech yesterday! 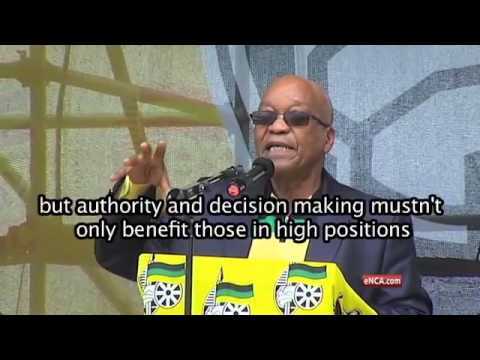 ““I always say to business people, if you support the ANC, you are investing very wisely. If you don’t invest in the ANC, your business is in danger. Tonight is [not only about the NGC] it is also to remind you that the ANC is a non-profit organization. t [the ANC] makes no profit. But it is very huge. It is the biggest organization in the country so just remember that this organization that you are associated with is a non-profit making organization which means that it is looking at you with a very interesting eye. Remember this organization because it has created an environment which is conducive for everything to be done. Let us work together, that is why more than ever before, you need to support the ruling party because it has very good policies and programmes. Remember that when you donate. We need you now more than any other time now. When the treasurer general knocks at your door open your door widely. If he says support the ANC, take out your cheque-book and tell him to write six figures]” (Khoza, 2015). And if that wasn’t enough… you have the price for the people attending the speech yesterday! While we’re talking about ANC and monies those need and wish for more support. “South Africa’s elite forked out anything between R100,000 to R1.5 million just for dinner with President Jacob Zuma on the eve of the National General Council” (New24Wire, 2015). If you are as me sadden by this reports and quotes from a President of the great South African nation. Then you’re not alone, I am sure more people are appalled by it. They just don’t express it. ANC has a heritage and it’s been destroyed from within. The destruction and dismantling of the values and conduct of the ANC party is a strange vision to see from a far. Because they have the ability and opportunity to actually do the right thing, but power corrupts and finding the ques to it is easy and when you find the faucets of gold, it’s hard to stop it. Easier to continue to pour the gold into the coffers then to actually use that to the people and constituencies that the ANC represent. That is something that nobody likes from a far to see and also with sorrow. Peace.